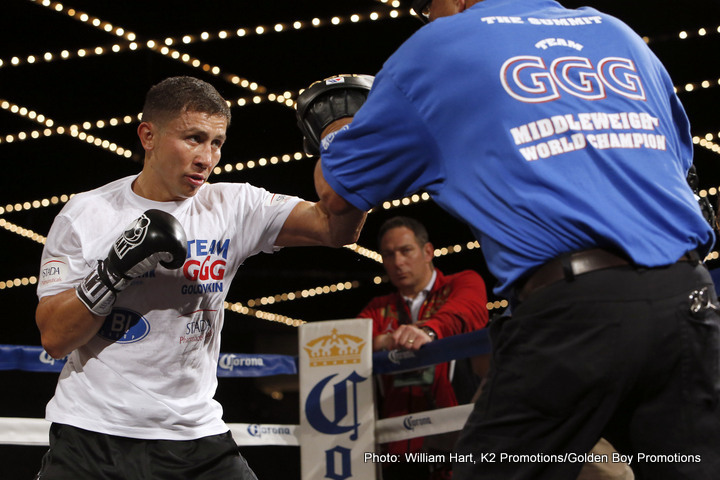 Gennady Golovkin-Dominic Wade on April 23rd - a mismatch or will the underdog rise to the ultimate challenge? Gennady Golovkin-Dominic Wade on April 23rd – a mismatch or will the underdog rise to the ultimate challenge? While the entire boxing world waits and waits for the guaranteed explosion that is a middleweight unification showdown between the unbeaten Gennady Golovkin and the once beaten Saul “Canelo” Alvarez, “GGG” keeps himself busy and also deals with a mandatory defence by taking on Dominic Wade on April 23rd. Golovkin, 34-0(31) will defend his collection of middleweight belts against Wade, 18-0(12) at The Forum in Inglewood, California. As would be the case with nearly every middleweight out there at the moment, Wade enters the fight as a considerable underdog, with some going as far as to call the fight a big mismatch. But Golovkin, who absolutely craves the big fights, as he has made clear time and again, has to keep busy. While Wade, a 25-year-old from Maryland, deserves credit for stepping up and taking a fight with the most feared man in boxing. But what kind of a chance does Wade have? Slim and none, some say, but Wade is unbeaten, he has a fine trainer in Barry Hunter and he is hungry and determined. Known as “The Blade” (let’s hope Wade is as tough and proves to be as dangerous as Iran Barkley was). Looking at Wade’s record reveals how his best, or at least most notable, win came against Sam Solliman. Wade won a split decision over the veteran who was 44-12 and coming off a loss to former middleweight king Jermain Taylor ( Solliman losing his IBF belt to “Bad Intentions” in his first defence as a result). There isn’t too much else of note on Ward’s resume, it must be said. Added to that problem, is the fact that Wade has not boxed since June of last year. Going up against the razor-sharp Golovkin when having even a small chance of carrying some ring-rust cannot be a good thing, you would think anyway. Wade had a pretty busy 2014 (four fights) but he boxed just twice in 2013 and not at all in 2012. Wade appears to need more experience than he currently has to be in with a realistic shot against Golovkin, most would have to agree. Still, Wade is taking his chances now and he should be commended for having the nerve to go for it. If he manages to go into the second half of the fight, even win a round or two, Wade will have done well. And with the type of match-ups Golovkin is forced to take as he awaits the big, big fights he wants, that’s about as much as we can either hope for or expect from his challengers. And providing he doesn’t get too badly hurt, Wade is easily young enough to be able to come again and use the fight with GGG as a valuable learning experience. Indeed, the only stat that is in Wade’s favour when entering this fight is age; at 25 he is eight full years younger than Golovkin. That aside, everything looks to be stacked hugely in Golovkin’s favour. Another stoppage win looks likely for the Kazakhstan who already has 31 KO’s on his impressive record. You are here: Home / Boxing News / Gennady Golovkin-Dominic Wade on April 23rd – a mismatch or will the underdog rise to the ultimate challenge?